AJ has been desperate to dye her hair for a while now but she is only young so I didn’t want her to have anything permanent. First we tried hair chalk, but they just didn’t take. To get any kind of colour payoff the waxy chalk made her hair look a greasy mess. Next we tried cans of spray. But again, the colour just wouldn’t take to her dark brown hair, then one run through with the brush and it was gone. She mentioned again today about dyeing it. The two of us watched a clip together on YouTube of a young girl dip dyeing her hair, and it looked a lot less complicated than I thought. So I decided I would give it a go. On arriving at the shops, it seemed the temporary fun colours were for blonde hair only. We could do wild if we wanted permanent, or the other choice seemed to be bleaching the hair first. Both options were a huge no. So in the end we took a chance with a colour suitable for dark blondes. AJ is dark brown and Bart is a mid brown, so I didn’t have high hopes, but at under a fiver for the box of dye, we gave it a go anyway. Improvisation was called for at the developing point. Neither girl was going to be able to sit still for the time required, but with sandwich bags and clothes pegs we managed to keep the rest of them dye free. In the end, the results were surprisingly good. Barts came out better, because of her lighter hair, but AJ’s has taken quite a bit of the dye too. Both girls are really happy with the results and I have to admit, for my first attempt dyeing their hair, I’m quite pleased. This afternoon we are heading out to a shop Jay wants to visit. It’s about a forty five minute journey and after weeks of sunshine and dry days we finally have some rain. And as we head east, it’s getting quite heavy. Which isn’t good when I’ve drunk a bottle of water before leaving home. Thank you Bart, but I think I’ll wait. This morning Bart asked what virginity was. Being the absolute chicken he is, Jay told her to “Ask your mother”. Trying to think of a nine year old context I told her it was someone who had never had a boyfriend, never kissed a boy. “How did you get to that conclusion?” I know her brain often follows a path slightly angular to the rest of us, but pet bird? “Losing a pet bird. Yep, we’ll go with that” Jay said. Growing up where I did in England, it was always a huge event going to the beach. We would set out early in the morning, all piled into the car with my Mum at the wheel and Dad riding shot-gun. Places like Weymouth and Bournemouth seemed so exotic to a landlocked child. Sandwiches would be packed for our lunch and we would spend the whole day playing on the sand, swimming in the sea, walking along the promenade and dipping in and out of the gift shops. Then if we were lucky we got to have fish and chips for tea, before heading home at the end of a long, happy day, smelling of sea, sand and sunscreen. Living where we do now, we can reach a choice of beaches in only thirty minutes. So most weekends, in all weathers, we head out as a family to walk along the sand. Today, as the girls half term holiday draws to a close, the four of us plus Artie the whippet, jumped in the car and headed out. It was a little chilly on arrival, but as we trudged along the sand and the sun began to beat down, we warmed up enough to start removing hats and coats. There was a great amount of interesting things washed up from the high tide, including a lot of starfish and a large crab that was stuck on its back. Jay picked the poor thing up as it was still moving and put him closer to the sea. We didn’t hang around, but hopefully he made his way back. Of course the trip was rounded out by a visit to the local shop and ice cream filled chocolate waffle cones were enjoyed before heading back home. When we have two little monsters at home you must be wondering why today we went looking for another one, but with the kids on their half term holiday, and both Jay and I having the week off work, we took the girls to Loch Ness to look for a legend. The weather was overcast but dry and not too cold considering we are heading towards November,so we were able to sit overlooking the stunning views while having a snack. Bart i s totally convinced she saw Nessie, she even got a badge to say so. Jay is equally convinced she may need go to the opticians for bad eyesight, because seriously, there was no monster out there. But every ripple was a potential sighting and she had fun. To be honest the only real monster sighting was the hundreds of stuffed toys in the gift shop. Bart’s eyes lit up like it was Christmas upon seeing all the plush monsters, but as she already battles to fit in her bed each night with the amount of cuddly animals already in it, she left the store empty-handed. In the afternoon I dragged the family to another ruin. After traipsing around numerous castles over the last few years, I changed it up a bit and took them to a Bronze Age burial site, with three stone cairns (mounds) each encircled by standing stones. It really is a beautiful place, with an air of peace and mystery to it surrounded by trees that are just changing to their autumn colours. Both AJ and I put our hands on the stones, but neither of us fell through time and Jaime Fraser sadly didn’t appear and whisk me away. But I think Bart felt something because she ran around the site, touching and hugging all the standing stones. It been a good day to get out as a family, to just take a bit of time away from the house and have fun. With Jay and I working longer hours and school suddenly getting real for AJ is in her last year of primary, to take time and laugh together was good therapy for us all. It really is tooth month in our house. After the excitement of AJ’s visit to the orthodontist things had quietened down. Then today I had a message left on my voicemail from the girls’ primary school. Bart was on her last swimming session of the term. Always on the final session they get to play and have fun. The message left informed me that Bart had slipped when trying to exit the pool and bashed her face on the side, chipping one of her front teeth. I then had visions flying around in my head of a screaming Bart, her blood flowing into the pool and mixing with the water and half her tooth floating to the bottom. A bit dramatic I know, but my imagination was running wild. I messaged James and he got in touch with the school. By the time he spoke to someone, Bart had eaten her lunch and was playing on her lunch break. I calmed down when hearing this as she was obviously not in pain, but still fretted over how bad the tooth was. Thankfully it really isn’t as terrible as my over active imagination thought. It was one of her front teeth, but it is quite a small chip at the bottom. Both girls are due a dental check up in a few weeks, so we will see what the dentist thinks when he sees her. In the meantime, Bart is milking it for all she is worth! As she is getting older it has become clear to James and I that AJ needs some serious dental work. Her two top front teeth protrude quite a bit and some of her bottom teeth are not coming in straight. I made an appointment for her with my dentist a few months ago instead of the one she normally attended and after having her in the chair for a few minutes he didn’t surprise me at all when he said she needed a referral to an orthodontist who specialised in children’s teeth. True to his word an initial consultation came through swiftly. So, Jay and I took a day off of work a few weeks ago and the three of us headed into the city to see the specialist. 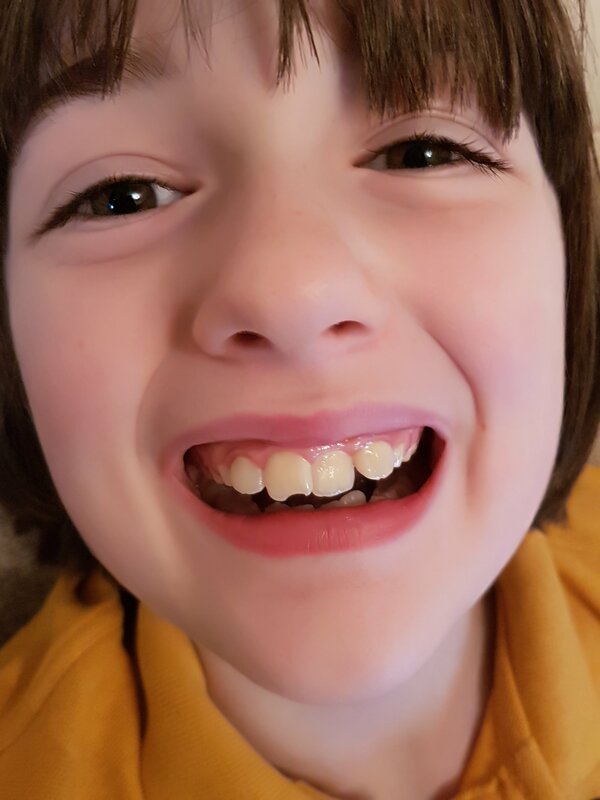 AJ was really great at the orthodontist, (luckily Jay hasn’t passed along his paralysing fear of all things teeth) and sat calmly while they measured, inspected and took photograph after photograph while pulling her lips this way and that. Then they did the dreaded mould. I remember having this done a couple of times as a child. They fill a plastic plate with a disgusting pink goo and then shove it in your mouth so far that you think you are going to choke. It is then held there for a couple of minutes while it takes time to set. I shudder just remembering it. But AJ was a champ and took the whole experience in her stride. The upshot is, as we guessed she had quite a road ahead of her. She will start with block braces that will help her bottom jaw grow forward and in line with her top one as it currently sits too far back. From there she will need “train track” braces to straighten her teeth and get them into the correct position and finally she will need to wear a retainer to help the teeth stay in place. Also at some point during this she will need four teeth removed so those that are left can shift and align themselves correctly. Poor kid, it’s not going to be fun and the whole process will take up to four years, or possibly more. At the moment she is enthusiastic and ready to go so we are just waiting now to see what happens next and when we start. This mornings breakfast table conversation. Bart: She brung it to school. AJ: No, she brought it to school. Bart: You say tomato, I say cheese and tomato sandwich.